Cable – an easy & efficient protection makes the difference. 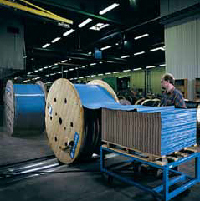 The flexibility of Lamiflex is ideally suited for metal coils: steel, aluminum or other nonferrous materials. The packaging solutions used by our various customer groups are adaptable for European and export packaging, depending on the transport conditions and needs from the end customer. Lamiflex offers various packaging solutions that have proven beneficial to our customers for many years. Lamiflex is dedicated as the industry leader to continue to develop lighter, reusable and recyclable alternatives for your packaging needs. Reduces drum flange damage and fits flush between flanges without hollow space. Provides waterproof UV stable drum covering. Is crush resistant to 100 kg/cm3. The material is fully insect resistant. Easy one man lagging process. Reduces risk of injury – eliminates risk from nails and splinters. Substantial savings in packaging time and therefore in labour costs. Eliminates waste – the width can be precut to requested size and length can be cut to traverse of width. Made from low grade wood products that are reusable. Lamiflex offers various packaging solutions that have proven beneficial to our customers for many years.